The best ideas, games and activities to play with blowing bubbles. Fun games for kids, toddlers and even older children! 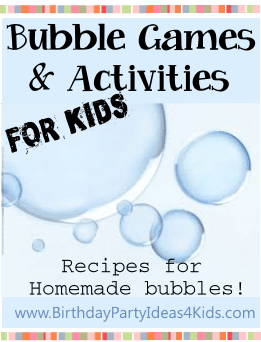 Print out the whole list of games to use when you are outside playing with bubbles! Bubbles are a great way to entertain kids and with these fun ideas you'll never run out different ways to play with bubbles. See our homemade bubble recipes for great ways to make your own blowing bubbles. Fill a plastic container with a spout at the bottom (like the ones used for sun tea) with bubble solution and label it "Bubble Refill Station". The kids can easily fill up their bottles with the spout. Or place paper cups next to the Bubble refill station and use the cup instead of bottles. Also have several different styles of bubble wands for the kids to choose from and try out. Give each child a foam sword and let them pop the bubbles with it. Pretend the bubbles are a bubble dragon or a thick forest that the kids must conquer. Place bubble mixture in a large bowl. Add a few drops of food coloring. Give kids a straw and have them place the straw in the bowl and blow making the bubbles rise above the lip of the bowl. Then have them take a piece of paper and lay it on top of the bowl. Take the paper off and they will have a fun bubble picture. Have the kids try and pop bubbles without using their hands. They can use their heads, elbows, legs, feet, knees, etc. 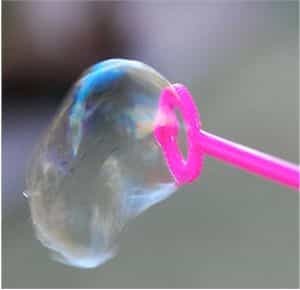 Blow bubbles and then try and catch them on the bubble wand. See if multiple bubbles can be caught on the wand. Divide children and let half blow bubbles and the other half hold the hula hoops. Have the kids hold the hula hoops out and the others try and blow bubbles through them. Then switch so everyone has a turn. Have a contest to see who can blow the biggest bubble. Make sure all the wands used are the same size. Have a contest to see who can blow the most bubbles with one breathe. Line the kids up and one at a time have them blow as many bubbles as they can with just one blow. See how long the kids can keep their bubbles in the air by having them blow underneath them to keep them from popping. Give each child 2 bubble wands and bubble solution. Have a contest to see who can blow bubbles and then stack them the highest on the second wand. Blow lots of bubbles and let the kids enjoy popping them. Set up a start and finish line. Have kids line up at the start line and blow a bubble. They then have to blow that bubble across the field and over the finish line. Divide kids into two teams and have them stand in line one behind the other. Set up a turn around point at least 30 yards from the starting line. One at a time the children will blow a bubble and catch it on their wand. They must then run to the turn around point and back to their team with out losing or popping their bubble. When they return to the start then the next person in line goes. If a bubble pops or they lose their bubble from their wand they must run back to the start and begin again. The team with all their players to finish first wins. Played like the regular game of tag except "it" has a bottle of bubbles and to tag someone they must blow bubbles on the other player. When a player gets tagged they take the bubbles and try and tag someone else. This is a fun game where kids try and dodge the bubbles that are being blown at them . Have the players line up about 10 feet from other players who are blowing bubbles. If a bubble pops on them they them switch places with the person who blew the bubbles. Have an adult mix a small amount of food coloring or water based paint in bubble mixture. Give children a piece of canvas or thick paper. Have the kids try and catch the colorful bubbles on the paper for a unique piece of art. Makes a great party favor! Experiment making different sizes and shapes of bubbles using different types of bubble wands. Pipe cleaners bent into fun shapes, slotted spoons, tubes, and hangers are some great ideas. See our Bubble Party Theme Ideas page for more fun ideas with bubbles!